Shall we dine at Oceana tonight? Or maybe instead we could make a lovely shrimp scampi from School of Fish, the new cookbook by Oceana’s executive chef, Ben Pollinger. Garlic, white wine, oregano, and a touch of butter make it sooo delicious. And even though it sounds fancy, it’s easy to replicate at home. 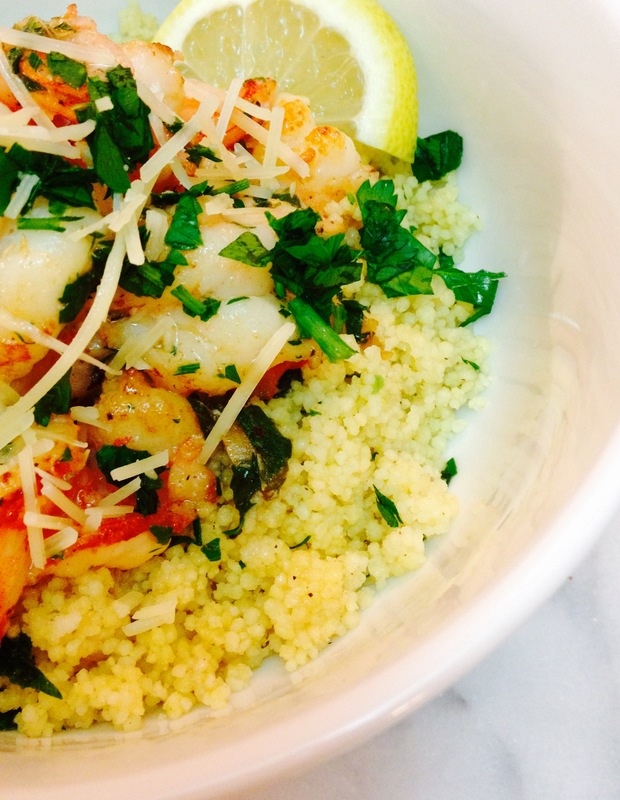 Serve it with some warm, crusty bread or fluffy couscous to take advantage of the scampi sauce, and a big green salad. And since you’ve got the white wine open already, why not enjoy the rest with dinner? That’s what I call the good life! Lemon options: The original recipe calls for the rind from 1/4 preserved lemon. If you haven’t got any, substitute a little lemon zest (perhaps 1/2 lemon’s worth). Prepare the shrimp: To get the nice curly shrimp effect, and also to ensure the shrimp cook through quickly, butterfly the shrimp by cutting deeply along the back, almost in half, until the shrimp can be opened up like a book, but still connected. Lay the little dudes out flat on a platter or cutting board as you work. Season the shrimp on both sides with salt & pepper, then let stand a few minutes (you could chop your parsley for garnish meanwhile). Blot with a paper towel so they’re dry and won’t sizzle too much in the next step. Saute the shrimp: In a large saute pan, heat 1 T. of the olive oil until it shimmers. Gently lay half the shrimp in the pan (they don’t have to be flat, but they do need to be in a single layer) and cook, without stirring, for 30 seconds. Flip ’em over (still in a single layer, don’t let them pile up) and cook another 30 seconds. The shrimp will probably have curled up by now. Cook a few seconds more if needed, until just pink through. Remove this batch to a bowl or plate. Repeat with the other half of the shrimp. When you’re done, you’ll have a big plate or bowl of sauteed shrimp. Remove your saute pan from the heat. Make the sauce: Measure out your wine, ready to add. While your saute pan is off the heat, add the pressed garlic. It might still be hot enough to sizzle and cook the garlic – if not, place over low heat and cook for about 30-40 seconds until garlic is fragrant. Add the wine, oregano, and lemon rind or zest. Return the pan to high heat and cook until the pan is almost dry, about 1 minute. Add the butter and stir over the heat to emulsify. Assemble the dish: Add the cooked shrimp along with any juices that have accumulated back to the pan. Cook over high heat to re-warm, about 1 minute. Squeeze the juice of 1/2 lemon over the dish and stir it in. Sprinkle with chopped parsley if desired, and serve. This is great over couscous, rice, or small pasta such as orzo. Or serve with warm & crusty bread to soak up the delicious sauce. Or both! Ha! Enjoy!